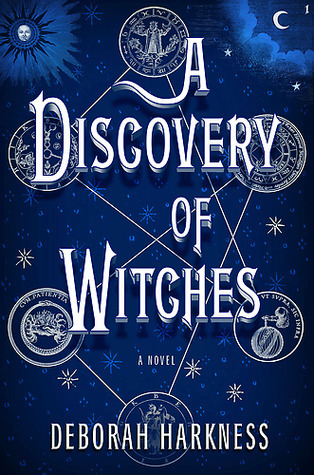 Summary from deborahharkness.com: When historian Diana Bishop opens a bewitched alchemical manuscript in Oxford’s Bodleian Library it represents an unwelcome intrusion of magic into her carefully ordinary life. Though descended from a long line of witches, she is determined to remain untouched by her family’s legacy. She banishes the manuscript to the stacks, but Diana finds it impossible to hold the world of magic at bay any longer. For witches are not the only otherworldly creatures living alongside humans. There are also creative, destructive daemons and long-lived vampires who become interested in the witch’s discovery. They believe that the manuscript contains important clues about the past and the future, and want to know how Diana Bishop has been able to get her hands on the elusive volume. Chief among the creatures who gather around Diana is vampire Matthew Clairmont, a geneticist with a passion for Darwin. Together, Diana and Matthew embark on a journey to understand the manuscript’s secrets. But the relationship that develops between the ages-old vampire and the spellbound witch threatens to unravel the fragile peace that has long existed between creatures and humans—and will certainly transform Diana’s world as well. This book is long. As much as I would’ve loved to make it a marathon and just read into the wee hours of the night, my lifestyle (ha! what lifestyle? I’m on maternity leave)…anyway, it wasn’t possible. So each time I opened the book, I allowed myself to just enjoy the writing and let Deborah Harkness spin her tale and wrap me in it. I loved the mix of historical fiction/fantasy. Harkness’ background as a scholar really comes through in her writing. It is thorough, and my guess would be in the historical fiction part of it, accurate – and if not, it felt accurate. Which in a work of fiction is probably more important. Each character is flawlessly created and distinct. I really felt that I was shown the layers that make up each character – no matter how minor and I loved that! It is a rich, rich story that truly offers readers the chance to get lost in a story. I also thought Matthew was a little too controlling. And his pet name for Diana “ma lionne” was too much…sure she survived being tortured by a fellow witch, but other than that I wouldn’t call this character brave…at least not yet. My annoyances with the characters were minor and didn’t really affect my overall opinion of the book. I liked A Discovery of Witches. I enjoyed the slightly different portrayal of vampires and witches. The writing and character development were superb. And, I loved the way Harkness weaved history and major historical events into the plot and the lives of the characters. It was fun to see the love story between Matthew and Diana develop thought at times it was a bit juvenile (I fell in love with you before you fell in love with me). The narrator treated the reader with maturity so it was easy to overlook instances like those. A Discovery of Witches was a little dense at times, but I think it worked. I will definitely be reading book two of the All Souls Trilogy, Shadow of Night.